DiskGenius is professional partition management software as well as an easy-to-use dynamic disk converter. It is able to convert dynamic disk to basic disk without data loss and the converting takes only several seconds. 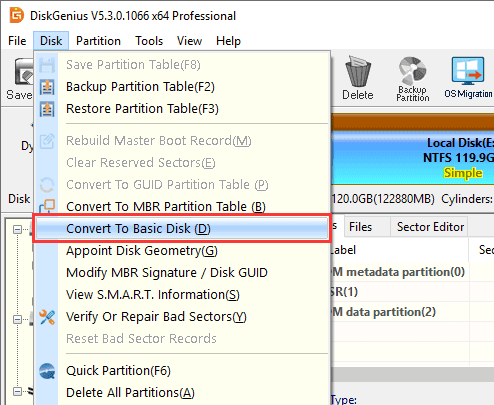 Step 1 Right-click on the dynamic disk you want to convert and select "Convert To Basic Disk". Step 2 Click OK button to confirm the option. Note: After converting, the disk cannot be converted to dynamic disk by the program. Step 3 Click "Save All" from toolbar and click "Yes" to save changed to disk.